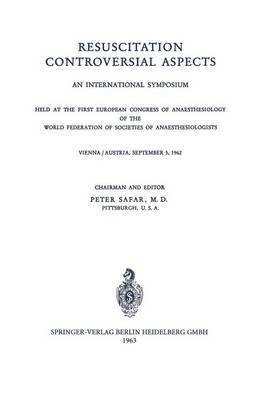 The First European Congress of Anesthesiology in Vienna, Austria in September, 1962 presented 19 Symposium discussions, each lasting approximately 3 hours. Unlike most of these panels, the one on Resuscitation was a free discussion on controversial topics, without presentation of formal papers. In spite of the spontaneity of the unrehearsed questions and ans- wers, the participants feit that an edited version of this Symposium should be published. The reasons for publication included the inter- national character of the group of participants and the recent general interest in respiratory and circulatory resuscitation. A presentation of accepted resuscitation techniques was omitted, because of lack of time and because the Symposium was held pri- marily for trained anesthesiologists, most of whom have first-hand experience with resuscitation and should be familiar with the accepted modern methods. Only controversial topics, which seemed to be of interest to those with personal experience in the application and the research of resuscitation, were included.